(Approx) 200 x 410 x 180 cm. Within our fragile environment, by ignoring and contributing to overconsumption and overpopulation are we signifying are we safe in our assumptions that economic growth will always be sustainable? The sculpture references a fragile and questionable sustainable balance between industry and natural mass. The piece is composed of three representational elements held together exuding vulnerability in an intimate yet completely reliant relationship. The clean continuous steel line corresponds modern rudimentary architecture in angle and medium; this draws a narrative path of an ever-growing economic succession through an interlocking polished framework. 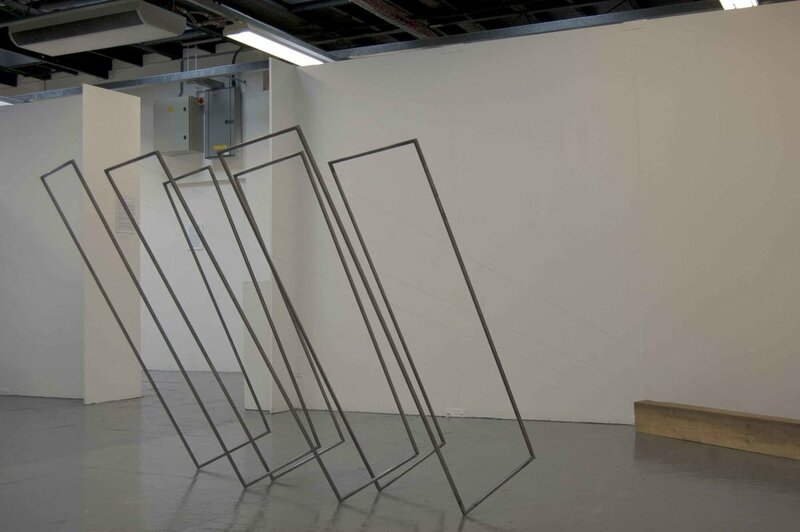 The use of repetition creating rhythm, narrative and movement is echoed when the structures are welded within one another in a sequential state. The scale of the work demands enquiry on a confrontational level, although grand and intrusive, the structure sits quietly unsettled completely held by the material mass. The natural is represented simply with the solid wood sleeper, organic and unprotected. This contrast with the highly engineered steel metaphorically represents the laborious efforts of an unnecessary revolution of convenience, holding the leather directly while referencing the tension and tested fragility of our economy. . William Tucker informs the delicate and the detail at every stage. William Tuckers ‘Cats cradle’, 1971 was the start of a group of steel sculptures that have helped infinitely in relation to special awareness and minimalism in relation to detail and finish. This interdependent balance relies wholly on the individual weight of each element. If a shift in mass was to occur the structure itself would collapse. Taking architectural and graphic inspiration from artists such as Joel Shapiro; the work takes the form of initial large scale paper drawings. The steel is then drawn in a way in which the two are constantly in association. The sculptures themselves hold tension, impermanence, in the sense they could topple over at any point. Antony Caro brings scale and industrial reference with his extensive repertoire of work.